Shirley Carstairs joined the practice in 2005 as a receptionist. She has 2 sons. She has always been a lover of animals and has been involved in various aspects of dog training for over thirty years and now runs the puppy parties at our Ladybank Branch on Wednesday evenings. 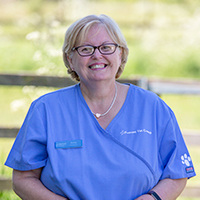 Her three dogs go to work with her and will greet you with a warm welcome as you arrive at our Ladybank surgery.